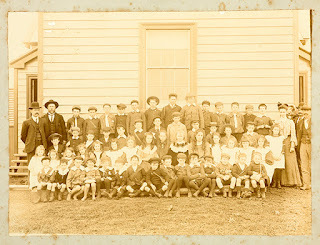 The photograph below was taken on the opening day of Manurewa School, 3 September 1906. This group includes a number of boys who a few years later would see active service during the First World War. Those in the back row are Walter Burton (fourth from left), Bert Ralls (sixth), Ted Mills (eighth), George Coxhead (tenth), Walter Costar (eleventh), Henry Lupton (thirteenth) and Bert McAnnally (furthest right). In the second row are Sam Craig (third from left), Douglas Wood (fourth), Horace Slight (seventh), Jack Freshney (ninth), Laurie Mills (tenth) and Fred Lupton (eleventh). Bert Mills is in the front row (tenth from left). Ref: Opening day, Manurewa School, 3 September 1906, photograph reproduced courtesy of Manurewa Historical Society, South Auckland Research Centre, Auckland Libraries, Footprints 03723. Walter Costar, Bert McAnnally, Cecil Slight and Douglas Wood would all be killed or die of wounds. Walter’s younger brother, Reginald, absent on the day of the photograph, would also die of wounds. Between 1914 and 1918 at least 184 men (and one woman) with Manurewa connections enlisted for active service. As many as 167 of them served overseas. Fifty-two did not come back. Relatively few who did come back had escaped either being wounded or contracting a debilitating illness. Ref: Front cover of Manurewa's soldiers, The photograph is of an artillery unit in training at Trentham Military Camp, 1916. Walter Costar is third from left. The recently released book, Manurewa’s Soldiers, compiled for the Manurewa RSA, by Bruce Ringer, Team Leader, South Auckland Research Services, tells the stories of these soldiers. It also provides a chronology of significant events during the war, describes civilian life in the township during the war, and lists the cenotaphs and rolls of honour in Alfriston, Wiri and Manurewa itself. It is illustrated extensively with photographs from Auckland Libraries' collections. Manurewa’s Soldiers has been distributed to all schools in the Manurewa Local Board area. Copies are also available for purchase from the Manurewa RSA. Lending copies can be requested from any branch of Auckland Libraries.